BlackBerry's latest devices, built under license by TCL, have been secure and sturdy, with exclusive software features designed to help you get things done faster. Some, like the BlackBerry KeyOne, have even improved on the physical keyboard with gesture support and a space bar that doubles as a fingerprint sensor. But recent BlackBerry phones have also been on the expensive side, despite middle-of-the-road specs. When critics call most smartphones nondescript black slabs, they're talking about devices like the BlackBerry Motion. 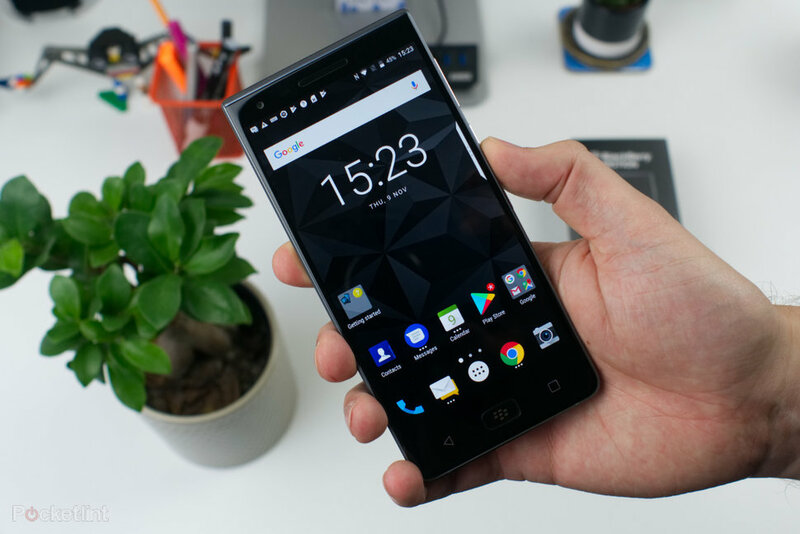 True, there are little touches all around the handset -- like the soft-touch carbon fiber-effect back panel and chamfered gunmetal frame -- that remind you you're using a serious, business-focused machine for serious, business-focused people. But the phone's not elegant, and compared to many of the devices that passed through our hands last year, it certainly isn't where the industry is headed. The Motion incorporates a 5.5-inch, full-HD panel and an asymmetrical design. At the top, a strip of plastic loops around the phone in a continuous curve, joining the bezel that contains the earpiece and front-facing camera with the portion on the back that houses the rear camera and flash. The bottom of the frame is not curved, so it's there that you'll find the USB-C port, headphone jack and speaker grille. It's a different look, though I wouldn't call it stylish. A 5.5-inch, full-HD LCD display is about what you'd expect in a midrange phone, and sure enough, that's what you get from the Motion. Those details alone don't tell the whole story, however, because the latest BlackBerry's screen also happens to be one of the best you'll find in its class. It's also one of the brightest. At a peak full-screen brightness of 520 nits, it's right on par with the 515 nits you get from the excellent 5.2-inch panel in the HTC U11 Life. I really like the way BlackBerry has calibrated the colors, too. Although the Motion's screen isn't the most accurate, with a Delta-E rating of 0.73 (numbers closer to 0 are better), it exhibits a deep range of hues, covering 170.7 percent of the sRGB color space. The Motion may be running an outdated form of Android — version 7.1.2 Nougat, to be specific — though you can't fault BlackBerry for not leaving its mark on the software. The phone benefits from BlackBerry's suite of workflow apps, which actually present sophisticated solutions to common problems in a few cases. The Motion comes equipped with the largest battery ever in a BlackBerry device, at 4,000 mAh. The last of the company's handsets we tested, the KeyOne, managed to last nearly 13 hours in our testing on a smaller 3,505-mAh pack — so if anything we expected to see better longevity here. Surprisingly, the Motion lasted for 11 hours and 44 minutes when we ran it through our battery test, which consists of continuous web surfing on T-Mobile LTE. A result in the neighborhood of 12 hours is still very strong, though a little surprising given the size of the Motion's battery. Camera quality is one of the major differentiators in choosing a smartphone today, and while the Motion won't put BlackBerry's imaging capabilities on the map, it performs a little better than you might expect. The Motion is equipped with a 12-megapixel, f/2.0 aperture lens on the back and an 8-MP, f/2.2 lens on the front. There's no fancy dual-camera trickery here — the Motion can't manage shallow depth-of-field portraits or optical zoom with its single lens. But this isn't a significant loss, as most dual-camera systems in budget and midrange phones aren't nearly as useful as their higher-priced counterparts. Despite its uninspired looks, there's actually a lot under the surface that differentiates BlackBerry's latest smartphone from the horde of budget options available to Android users. But is the premium worth it? The Motion has a great display, a solid camera and a decent processor — but so do many other handsets.